“It’s a big upgrade,” said a wide-eyed and smiling Emma Loveland while standing on the edge of the brand new pool at the Buncombe County Schools Aquatic Center. The T.C. 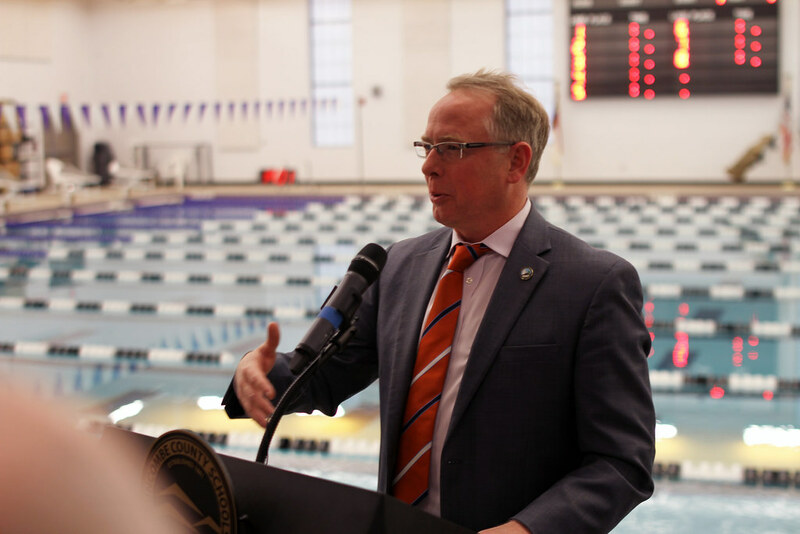 Roberson Swim Team co-captain notes that the facility will be well-used by current and future swimmers and is a much needed and welcomed amenity. Meantime, T.C. Roberson Swim Team co-captain Nick Loomis noted the logistics of practicing and holding meets at the school will be significantly easier for him and others across the County. “This means a lot more representation for swimming as a whole sport,” he exclaimed. The pool features ten lanes and is 25 yards long and can also be used perpendicularly for 25-meter competitions. The Buncombe County Schools Aquatic Center Pool was designed primarily as a competition pool for high school events. Accommodations were made for multi-purpose uses such as swim lessons, training programs, physical education, Masters swimming competitions, therapy, and other public and semi-public uses.